If you are going to take on a new challenge, you need a strong partner by your side: that’s the idea behind OBI’s interactive garden planner – and we at conoscenti agree. So it made sense to cultivate the field together. The joint project: determining the optimal media and environments for the campaign to launch the OBI garden planner. Before starting production of the promotional material, we conducted to this end a Media Quality Scoring (MQS®) based on OBI’s new offer. We additionally used touchpoint tracking to monitor what was happening at over 40 touchpoints from above-the-line advertising to the point of sale, during and after the placement. With over 350 stores and an unaided brand awareness of over 76 percent, OBI is one the leading provider of construction and DIY supplies in Germany. OBI’s footprint also stretches into the rest of Europe. The new OBI garden planner helps hobby gardeners plan and carry out their garden projects. The spectrum spans over 20 different projects from putting together a raised bed to building a garden shed. It was important to OBI that its advertising for the garden planner did not just reach as many viewers and readers as possible. Rather, it wanted to concentrate on those particularly receptive for the benefits of the garden planner. Using the long-since tried-and-trusted MQS® analysis, we determined the best suited media and environments for the campaign. Findings: In order to reach potential users of the OBI garden planner, a combination of print and television advertisements proved ideal. Taking MQS® as a basis, we were able to recommend to OBI specific genres, titles, and programs. Particularly insightful was the wide variance within individual media. In television advertising, for instance, the genres best suited for OBI showed an MQS® that exceeded that of less suitable genres more than twofold. OBI was able to integrate these insights early on into its campaign planning in order to generate the greatest possible impact with the allocated budget. In order to ensure that the campaign actually had the intended effect and to gain further insights about the brand performance, OBI set up a sophisticated touchpoint tracking system. 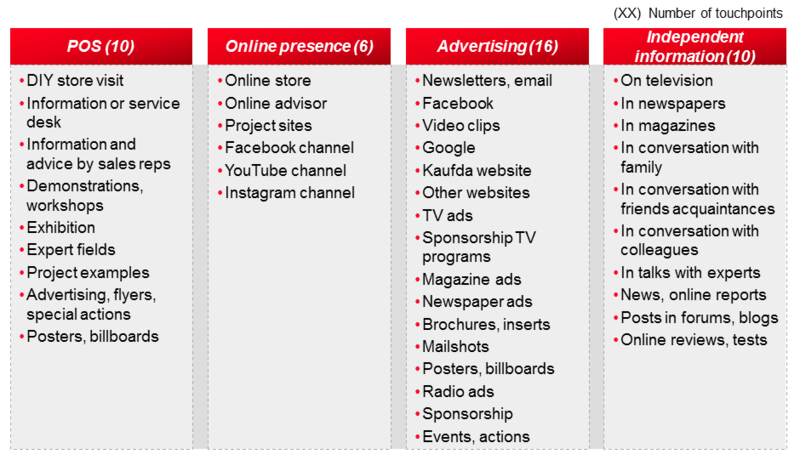 conoscenti determined for OBI at 42 touchpoints (image) where and how often customers interacted with OBI as well as the contribution of these touchpoints toward achieving the campaign’s objectives. Thanks to a combination of automated recording of digital touchpoints and accompanying multilevel surveys, it was possible not only to record website visits and the use of the online garden planner, but also point-of-sale touchpoints at the DIY stores and during conversations with acquaintances. In total, over 20,000 contacts were fed into the analysis. Findings: The number of users of OBI garden planner by far exceeded all competitors. Offline too, in OBI stores, the garden planner expertise fields achieved a significantly greater reach than comparable offers of the competition. The vast majority of users stated that their experience with the garden planner had been extremely positive. In addition, OBI saw an evident image improvement in dimensions like “competence”, “ideas and inspiration”, “personalized solutions”, and “advice”. Why was the campaign such a success? Aside from a great execution, the success was not least due to placements within the right environments. Touchpoint tracking confirmed that the print media and television programs selected with the help of MQS® made a decisive contribution to the successful outcome. Television advertising was the most important driver of the campaign’s reach. The print advertisements helped to systematically target additional potential users of the garden planner and to encourage them to give it a try. Developed by conoscenti, MQS® can not only be used for all common types of media, from TV to online, but also for a broad spectrum of individual advertising objectives. With MQS®, advertisers can draw on insightful data when planning their campaigns, before spending a single euro on ad placements. With touchpoint tracking, conoscenti additionally offers comprehensive monitoring of over 40 touchpoints (online and offline). It is thus possible to determine where customers come into contact with a brand and which touchpoints have a pronounced impact on sales and image. Are you too interested in using MQS® or touchpoint tracking in your company? We would be happy to answer your questions and discuss your ideas. Get in touch now.